2009 was a tumultuous year. I was 52, working as an RN in a local hospital part-time and trying to parent 3 teens along with my physician husband who works all the time. I had taken FMLA from February to May to be at home with my then 17 year old teenage daughter who was trying her best to not graduate from high school. A series of poor choices on her part had led to heart ache for us as well as her. She did graduate, but had no idea what she wanted to do with her life. Her 20 year old brother was in college and her younger sister at 15 was loving high school. We raised them all the same, but as you all know, they each have to find their own way. In July of 2009, I suffered a work related injury that blew out my lower lumbar spine and as hard as I tried to work through it and continue with my nursing job, I was in agony. My nursing manager finally said I had to go out and stay out in mid September as it was obvious to everyone I could not do my job effectively in so much pain. Then came October, 2009. I had a bout of asthmatic bronchitis the third week of October. I have had it many times before, but this time was different. I could not breathe despite my normal medications and I became very weak. I finally said to my doctor husband on the 18th to take me to the hospital ER. The xray showed pneumonia, but I knew it was something more. I had the feeling of doom that many patients had expressed over my 30 year career working in the ER and ICU had expressed right before they coded and died. I had Swine Flu Pneumonia that wiped out over 90% of my lungs. After 2 weeks in the hospital, I made it home on home oxygen, weak, debilitated, moon faced from the massive amounts of steroids that saved my life. I had met God in my hospital room in the wee hours of the night, struggling to breathe, and we had a conversation. If I was indeed my time to go, I was okay with it. If not, I still had work to do. Physical Rehabilitation started in January, a very long and arduous process. At least I was alive and determined to get better. February 5th, my beloved 15 year old standard poodle died of heart failure. Could it get any worse? As I laid in bed most of the day, I missed her companionship. 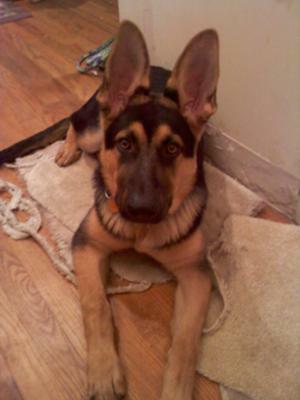 I started to google breeders of German Shepherd dogs to look for a puppy. I had always wanted one and I did my research on the breed and breeders. As luck would have it, a litter had been born January 18th to a breeder not too far away and the puppies looked adorable as they all do when I saw them on the website. My husband had said no more dogs, but of course that went in one ear and out the other. I took my now 18 year old daughter with me to see the puppies as she has always gotten along better with animals than people. We entered the breeder's home and saw 8 puppies that were bouncing around, playing with each other. I had read all of Cesar Millan's books and he recommends a medium energy dog for people in my condition. I believe he says for you to choose the puppy, not for the puppy to choose you. Well, a beautiful female puppy chose my daughter and all that advice went out the window. We put a purple collar on her and told the breeder we would be back on the weekend with my other daughter and husband to make our final decision. My unwilling husband and daughter and I went out that Sunday to make our final selection. I never told them what color collar puppy had chosen us. I wanted an unbiased opinion from these two members of my household. Wouldn't you know it, the purple collared puppy picked them both. My husband melted and consented. The purple collared puppy was ours. We went two weeks later to pick her up. My older daughter had suggested Zuri as a name. It means "beautiful" in Swahili. So Zuri Delacoeur (of the heart) came home with us. Her crate was in my bedroom as that is where I spent 22 hours a day. A bond developed between Zuri and me as I was her primary companion. She made me get up in the morning (and night! ), out of bed, and we walked our street and met dogs, kids and neighbors I had never met. She went with me to Dunkin Donuts every day where they gave me extra cheese that I hand fed her. She learned "no teeth", how to walk properly on a leash at my pace, and with the help of two fabulous GSD trainers, we learned basic obedience. Every day, she grew more and more beautiful as I fell more and more in love with her. I never knew that a bond between dog and owner could be this deep. I had gotten my poodle when my children were 7,4, and 2 and she basically trained herself. This was different. Zuri has grown into a beautiful 15 month old GSD and is my constant companion. She goes everywhere with me. She jumps into my husband's side of the bed when he leaves for the office and sleeps with me, head on the pillow until I awaken to feed her. It took 17 months to recover from the Swine Flu Pneumonia and Zuri was there for every step forward and every setback. I recently had extensive back surgery to fix the injury I sustained at work. My 3 children now all live at home to help take care of me as I am "disabled" between my illness and surgery. And who is Zuri's favorite person? My older daughter who first chose her. I always know when she comes through the front door as Zuri will go bounding down the stairs, with a joyous bark, thumping her tail against the wall. Zuri will then come trotting back in to get one of her toys and trots back out as her playmate is home. My daughter, who has so many emotional scars at the ripe age of 19, is a different person now. Zuri has healed many of those wounds as she is helping me heal physically. She has been there with her puppy licks and kisses when my son was diagnosed with a mental illness requiring us to pull him out of college to be treated and get him on the right track. She has kissed my foot when I fell and sustained a midfoot sprain. My beloved father died unexpectedly last year and Zuri has been there for me and licked my tears away. Zuri listens to me talk as there is no one else to talk to as I recover from surgery. In her own way, she talks back with unconditional love and her mere presence in my room or close by. Zuri has healed a family from life's wounds and brought them closer together. She has been the unifying bond amongst all of us and has brought laughter back into our home with her "exuberance" and antics. 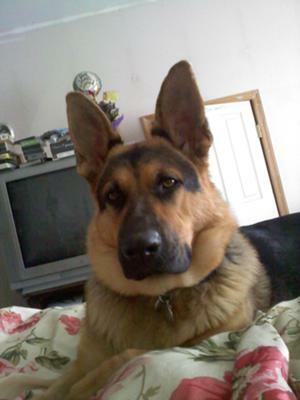 It does not matter that she is not conformationally perfect or the ideal specimen of a GSD. What she is, is a wonderful addition to our family, our saving grace and a healer of all wounds. Everyone should be so lucky as to own their own "perfect" GSD, whatever that may be.